Madison Square Garden, New York City, New York, U.S. The 60th Annual Grammy Awards ceremony was held on January 28, 2018. The CBS network broadcast the show live from Madison Square Garden in New York City. The show was moved to January to avoid coinciding with the 2018 Winter Olympics in Pyeongchang, as was the case in 2010 and 2014. James Corden returned as host. Bruno Mars was nominated for six awards and won all six on the night. ✪ 60th Grammy Awards Recap and Reaction! India Arie "I Am Light"
Keb' Mo' "Diving Duck Blues"
Little Big Town "Better Man"
Shaggy "Englishman in New York"
Nominees list adapted from the Recording Academy's website. "Body Like a Back Road"
Is This the Life We Really Want? All music creators, including songwriters, producers, engineers, mixers, mastering engineers and featured artists, which are credited with at least 33 percent or more playing time on the winning album will be eligible to receive a Grammy in the Album of the Year category. This is the first time songwriters are recognized in this category. An exception on the rule of only one version of a song allowed to enter in the Grammy Awards nomination process will be made in the Best Song Written for Visual Media category, allowing the film version of a track to be entered in the category, even if a different version of the track is submitted in other categories. In the Best Compilation Soundtrack for Visual Media category, eligibility guidelines have been amended to require soundtrack albums for a documentary or biopic to contain 51 percent or more of newly recorded music. The 60th Annual Grammy Awards marked the first time since 2003 that the ceremony was held in New York City. The Staples Center in Los Angeles had been the home of the Grammys since 2000. The 2003 ceremony was also held at New York City's Madison Square Garden. The fifteen-year gap between the 2003 and 2018 Grammys in New York marked the longest period of time New York went without hosting the awards. With the main telecast being held at Madison Square Garden, the premiere ceremony (also known as the Pre-Telecast) was held at the Hulu Theater. The MusiCares Person of the Year tribute is typically held at the Los Angeles Convention Center two days prior to the Grammys, but since the 2018 Grammy Awards were held in New York, the MusiCares tribute was held at Radio City Music Hall. Hosting the Grammy Awards in New York City resulted in the Grammy Awards costing more to organize as costs associated with hosting it in Los Angeles are significantly less. The awards cost $8 million more to host in New York City. The host committee that the city assembled failed to raise the money that they had initially promised. The MusiCares Person of the Year tribute which the Barclays Center (which is operated by AEG) was hoping to host ended up being held at Radio City Music Hall, which is owned by The Madison Square Garden Company. MusiCares funds which were intended for charitable purposes were instead used to pay for the $8 million cost overruns associated with hosting the Grammys in New York City. Dana Tomarken, the former Executive VP of MusiCares claims that Recording Academy President Neil Portnow directed these funds away from MusiCares to pay for the cost-overruns. In May 2018, Portnow announced his resignation from the Recording Academy which will be effective in July 2019. Dana Tomarken had been negotiating a deal to have the MusiCares Person of the Year tribute to Fleetwood Mac to be held at the Barclays Center, but Portnow decided to have it at Radio City Music Hall, without consulting Tomarken. Irving Azoff who heads Azoff MSG Entertainment (which is affiliated with The Madison Square Garden Company) informed her of this change rather than Portnow consulting her first. Tomarken has since made a claim of wrongful termination. On June 4, 2018, the mayor's office weighed in on the controversy, saying their position was always to be "venue neutral" and denied any involvement in the venue controversy. The Barclays Center notified City Hall of their interest in being involved with Grammy week and Julie Menin (the New York City Commissioner for the Mayor's Office of Media and Entertainment) passed that information along to Grammy organizers. On June 5, 2018, an independent investigation was launched to examine the claims made by Dana Tomarken. The investigation will examine the MusiCares Person of the Year tribute as well as sexual harassment allegations. ^ "TV Ratings: Grammy Awards Hit All-Time Low in Key Demo". Variety. January 29, 2018. Retrieved January 29, 2018. ^ "When are the 2018 GRAMMYs?". Grammy.com. 9 May 2017. Retrieved 1 August 2017. ^ "James Corden to host 60th GRAMMYs". Grammy.com. 18 May 2017. Retrieved 1 August 2017. ^ "See The Full List Of 60th GRAMMY Nominees". GRAMMY.com. 2017-11-27. Retrieved 2017-11-28. ^ "The Full List Of 60th GRAMMY Nominees". GRAMMY.com. 2017-11-28. Retrieved 2017-11-28. ^ "Bruno Mars wins big at Grammys 2018 while Kesha's #MeToo performance soars". Guardian. 29 January 2018. Retrieved 31 January 2018. ^ "Bruno Mars Sweeps Top Prizes at the 2018 Grammy Awards". New York Times. 28 January 2018. Retrieved 31 January 2018. ^ Recording Academy [@RecordingAcad] (28 January 2018). "We're ready for some music! See @indiaarie perform "I Am Light" at the #GRAMMYPremiere Ceremony. WATCH NOW grm.my/2kijka1 #GRAMMYs" (Tweet). Retrieved 28 January 2018 – via Twitter. ^ Recording Academy [@RecordingAcad] (28 January 2018). "NOW LIVE See @stileantico perform "Gaudete In Domino" at the #GRAMMYPremiere Ceremony grm.my/2kijka1 #GRAMMYs" (Tweet). Retrieved 28 January 2018 – via Twitter. ^ Recording Academy [@RecordingAcad] (28 January 2018). "WATCH @MsJazzHorn perform "Moanin" at the #GRAMMYPremiere Ceremony grm.my/2kijka1 #GRAMMYs" (Tweet) – via Twitter. ^ Recording Academy [@RecordingAcad] (28 January 2018). "Head over to www.grammy.com to see @tajmahalblues and @kebmomusic perform "Diving Duck Blues" at the #GRAMMYPremiere Ceremony: grm.my/2kijka1 #GRAMMYs" (Tweet) – via Twitter. ^ Recording Academy [@RecordingAcad] (28 January 2018). "The #GRAMMYPremiere Ceremony continues with music from @BodyCountBand! Watch them take the stage to perform "Black Hoodie" grm.my/2kijka1 #GRAMMYs" (Tweet). Retrieved 28 January 2018 – via Twitter. ^ "Kelly Clarkson, Tony Bennett, Alicia Keys & More Set to Present at the 60th Annual Grammy Awards". Billboard. Retrieved 29 January 2018. 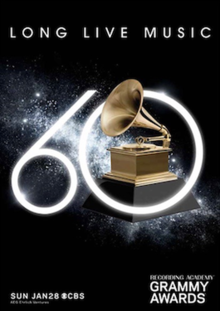 ^ "60th GRAMMY Awards: Full Nominees List". The Recording Academy. November 28, 2017. Retrieved November 28, 2017. ^ "Grammys awards 2018: full list of winners". Guardian. 29 January 2018. Retrieved 31 January 2018. ^ Karp, Hannah (14 June 2017). "Grammys Make Sweeping Changes to Voting, Top Album and Rap Categories". Billboard. Retrieved 1 December 2017. ^ "Top Artist Managers Express Concern for MusiCares Amid Turmoil as Recording Academy Announces Record Dollar Distribution". ^ "Grammy CEO Accused of Covering Telecast Shortfall With Bad MusiCares Deals". ^ "NYC Mayor's Office Weighs In on MusiCares Location Controversy: 'Our Position Is Always to Be Venue Neutral'". ^ "MusiCares Announces Independent Investigation Into Person of the Year, Harassment Allegations".